Back in the nineties of the last century, when Frank was beginning to create this wonderful Internet magazine, I was still studying civil engineering. My dream was to construct bridges or hightowers or something like that. City planning was also a subject I came in contact with and had to write a test about. Although my main job has only little to do with the building of cities or houses, I am still fascinated by this discipline. As a result, games with architecture as a background story always have my attention. 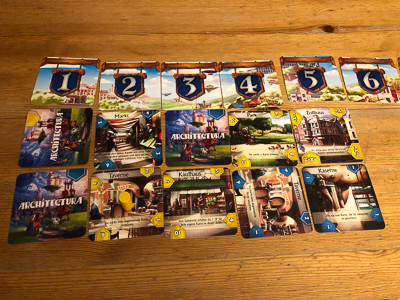 So it's no wonder that the small Architectura card game came to my list for SPIEL 2018. In the game, we build up a more or less magnificent city. As usual everyone wants to be the most respected architect of the new city. For this each player gets his own set of building cards that is shuffled during setup. 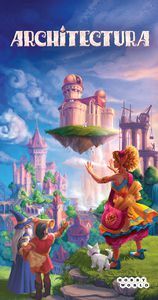 On their turns, the players take the three top building cards of their decks and add one of the buildings to the city. This city consists of 8 columns and as many rows as there are players. And the city is developed in order, from left to right. Thus, a building can either be placed on a free space to the right next of an existing building, in the first space (leftmost) of a new row, or a space occupied by a face-down card. A face-down card indicates a building that has been destroyed. Yes: Architectura is a mean game in which buildings can be destroyed after their construction. Let's see how this works: first thing you have to know is that each building has its value. And this value can change during the game by rotating the card to the left or the right. Now, immediately after a new card is placed on a free space, the building's value is compared with the current value of the building to its left. And if the value of the card to the left is at least two times lower, this card is destroyed and flipped to its back. 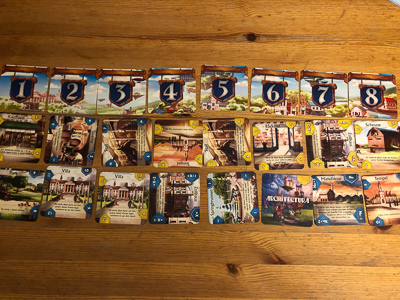 If however the value is just one step lower, the card to the left is rotated counterclockwise, so the new (lower) value of the building comes to the top of the card (each corner of the card has a different value printed on). Finally, if the card to the left has a higher building value than the card that has been played, the first card is rotated clockwise and a higher value comes to the top of the card. This should be performed in preference when the old card is your own card, of course. But each card has also a special effect that is resolved after the values have been compared. And those effects are manifold, e.g. you can destroying all cards in the row with lower values or rotate two of your own cards. Other cards can also be played on top of others or help to excavate destroyed (flipped) buildings again. 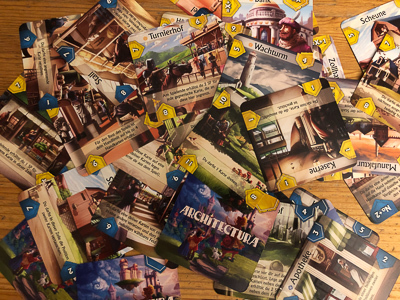 In the standard version of the game, each player has the same set of 12 cards. But up to six of these cards can be exchanged with unique, individual cards. And this advanced version of the game is the true challenge. So, the city changes a lot during the game with each player trying to position their own buildings safely, while at the same attacking the other players' houses. A nice, simple game with good artwork. I found the replayability to be high enough, mainly because of the short game duration and the unique cards in the advanced version. Also a lot depends on the positions of the buildings that changes dramatically from game to game. A game that could be interesting to you, if you are looking for a fast game in the architecture genre you can play with your whole family. Strategy plays a minor role, you have to react to what your fellow players do. But that's quite OK for this type of game and considering the short game duration.